A no-fuss yellow cake covered in delicious chocolate buttercream frosting all made from scratch. No need for fancy techniques. All you have to do is dump all ingredients in a bowl, mix, place batter into pan, bake and frost! 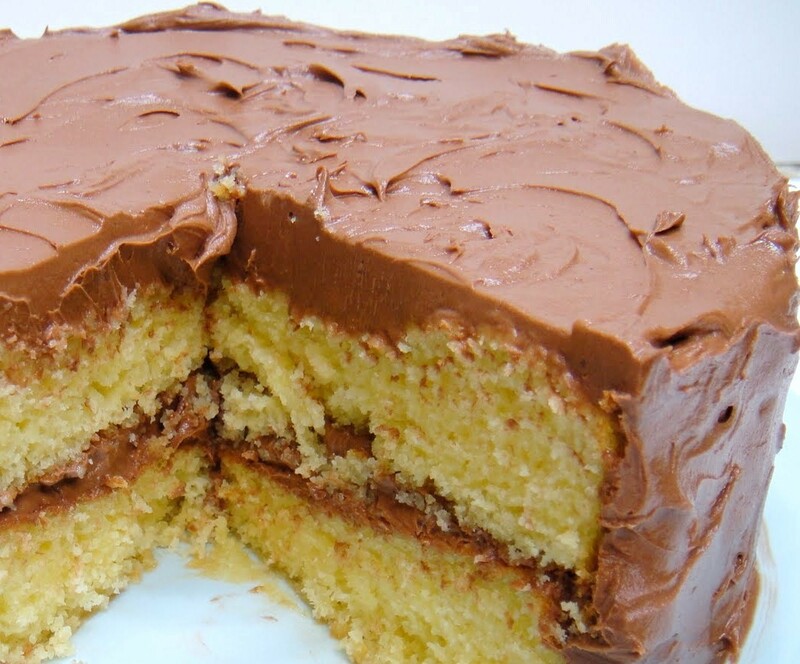 Here is an easy dessert recipe for Yellow Cake with Chocolate Buttercream Frosting. Preheat oven to 350°F (175°C). Grease and lightly flour two 9 x 1 1/2-inch round pans; set aside. Combine all ingredients in a large mixing bowl. Using an electric mixer, beat on low speed just until ingredients are wet. Increase speed to medium-high and continue beating for 2 minutes. Pour batter into prepared pans. Bake for 25 to 30 minutes, or until done. To test, insert a wooden pick near center of cake. Cake is done if tester comes out clean, or cake springs back when touched lightly in the center. Cool cakes on wire racks for 10 minutes, then remove from pans and cool completely on wire racks. Meanwhile, prepare the frosting. Combine the powdered sugar and cocoa in a large bowl; add the softened butter, vanilla and 5 tablespoons milk and beat on low speed until ingredients are combined, then on high speed until well combined. Add more milk, if needed, to achieve desired spreading consistency. Fill and spread frosting on cooled cakes.